Organisation: Set up 4 Area&apos;s. making each one 10x10. With a space of 25 yards in between, Above i have A passing to B, C to D.
3 players in each square are to get the ball from their box to the opposite box with a Long Pass, can do this using the various types of passing, Lofted, Driven, Chipped and Swerve. 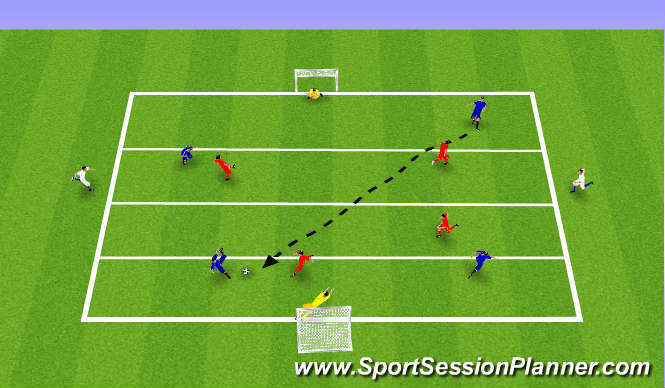 You can move this game on as shown in Grid D, by giving players a number of 1 to 3, with 1 recieving the ball, passing to 2, who then sets the ball up for 3 to make the long pass, rotate players after each pass. Key Factors: Body Shape/Knee bent, Angle of approach, foot shape toes pointing, Weight of pass. Organisation: Overall area size is 20x60 this is split putting a team in a area of 15x20 either end, which leaves a middle area of 30x20 in the middle, in this middle area, there is a defence box that is 5x5. 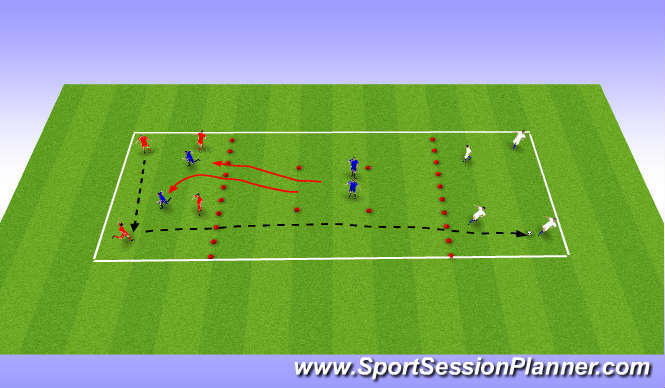 Aim of game is players in box A have to pass the ball to Box C, but they have to make minimum of 3 passes in their own box first, they must do this under the pressure of having 2 Defenders trying to stop them making the pass, who are released from thier gate as soon as ball is in the area. Once ball is passed to next box succesful, defenders have to get back into thier gate before other 2 defenders can leave and close other box down. Once a team loses possesion, they become defensive team. Coach to keep a supply of balls to make tempo of game fast. Can progress this game by making A and C area smaller, make minimum passes 5, and even allowin remaining 2 defensive players be able to stop the long pass in the middle box. Key Factors: Create space to recieve ball, Observe movement of team mates to create pass, Type of pass, Weight of pass, Body adjustment, Recognise importance of keeping possesion. Organisation: A pitch set up 40x60, split the pith into 1/3s, 4v4 with 2 floaters, Condition the game so that a pass to the final third can only come from the first third. if ball in middle, it must be passed back. Key Factors: Accuracy of pass, Co-ordination, Movement, Team work, Decision making, different types of technique on pass.